The set of yarn for the kit offered here. 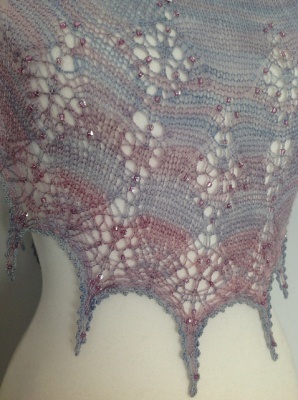 We have a few marvelous kits set up and ready for a new home for this beautiful shawl. 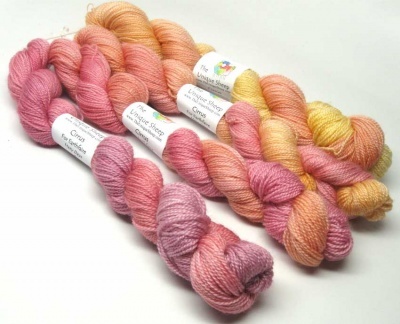 Our current in-stock kits are all the colorway #'d 1:00 to 4:00, a lovely golden to apricot to pink blend of hues. Read below for more data. It is best if you get your pattern from the Boo Knits Ravelry page here. We offer here yarn and beads to make this beauty. Each set is composed of 4 skeins, three of which are 25g (218 yards) and one a "fatter" 33g (291 yards). The reason one end of your color Gradiance of yarn has a fatter skein than the other three is the designer's recommendation that you consider this your Yarn A. 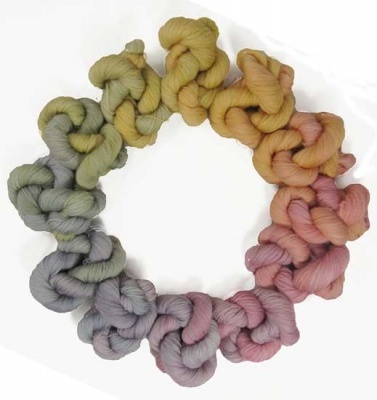 This would be the color skein to start your shawl and for the final bind-off. It is not essential -- so if you really would like to start from the other end, you can do so. None the test knitters had this fatter skein to choose as their first one and they did fine. We are including it simply so it can be easier and you can be assured that you have enough to include the bind off. These colorways were developed by Kelly and based on the circle you see in the second photo on this page. She originally named this circle Waning Rainbow but it has adopted the name of this shawl (slightly modified) and is now called Hazy Days. It includes all of the colors of the spectrum but softened up with a touch of gray. 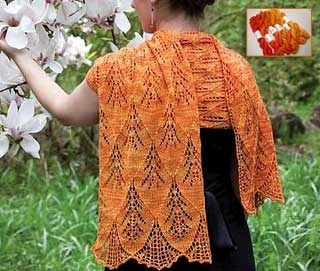 The colorway we have in stock is 1:00 to 4:00 -- a gorgeous sunrise of tones. The skeins of yarns for this colorway are shown in the third photo on this page. The finished shawls you see on this page are other parts of the color circle. Bev chose from 5:00 to 8:00 for her shawl and those are the partial photos you see above -- a beautiful delicacy of coolness. Because the colors are so gentle, I thought it best that the beads mirror this. For the 1:00 to 4:00 colors, I like the Apricot Lined Crystal triangles, a golden tone that mirrors colors found in the first two skeins. The Peony Pink Lined Crystal also works well for this set. If you have a preference, let me know. Otherwise let me choose for you. The pattern is not automatically included in this kit. 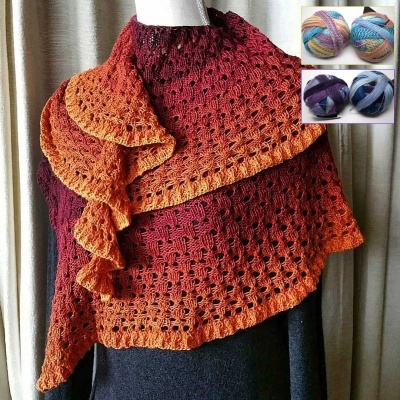 This page gives you the yarn and beads to make this beauty. We strongly suggest that you get the pattern directly from Bev via her Ravelry web page. The pattern will be saved in your Ravelry library and you will automatically get the latest edition of the pattern along with any needed updates. If you would prefer a printed copy or a PDF via email, please let me know and I will set that up for you instead.